Last night my colleague Alan and I were leading our normal Thursday evening back-to-back Bible studies in the Skagit County Jail in Mount Vernon. We started out just after 7pm with two men from “A Pod”. Both men were visibly upset as they were facing the normal post-arrest chaos: criminal charges, family upset, detox from drugs and alcohol, un-determined sentence. I could see we needed to pray before looking at a passage from the Bible, and asked if they were okay with that. One man surprised me by his unusually generous attitude of a intercessor: “Every day I pray that God would be with all the people out there, protecting them and blessing them wherever they are.” After asking Jesus to pour out his Holy Spirit on us, to fill us with his peace, to open our hearts and minds to hear God’s Word to us, I included this man’s prayer, asking for God to truly protect and bless the people out there on the streets, in the world, including our loved ones. Alan and I then went on to pray and prophesy over the two men, and the Spirit visibly touched them. 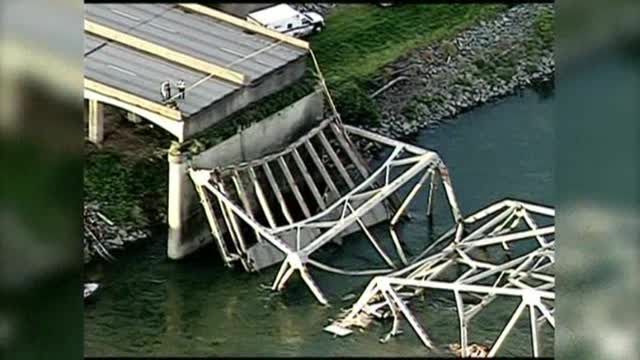 At the end of second Bible study the guard informed us that the bridge over the Skagit River had collapsed. He didn’t know whether anyone was hurt or killed, but the men in our third Bible study were all very upset and wanted to pray. Jail staff had just announced that the phone system was down for the night, so the men were quite concerned that they wouldn’t be able to call family to find out whether their loved ones were okay. Everyone seemed quite earnest about praying for all the people affected by the bridge collapse. Our reading of 1 Corinthians 6:19-20 also seemed to move the guys. Imagining cars on I-5 driving 60-70 miles per hour off the edge of the bridge into the frigid Skagit River was making people think. “I cross that bridge several times every day when I’m out there,” one man said. The idea that our bodies belong to God, are bailed out of death’s prison grip by Jesus’ death and resurrection was making sense and looking attractive and needed. We were all feeling the desire to surrender our fragile selves to the One who made us and ask for Holy Spirit to fill us. Our last Bible study was interrupted by one of the inmates being called out by the guard. The men were worried for him, wondering if he was about to be told that one of his family members had been injured or killed. In fact Alan had left early to meet with him one-on-one. He’d just been found guilty and was looking at a 15-year prison sentence. The men all wanted to pray for him, for his family, and for anyone else affected by the bridge collapse. I left the jail last night in bumper-to-bumper traffic as traffic was being re-routed. I headed to my parents and watched live footage of rescue workers searching the river for survivors. Only a few cars had gone over the bridge and nobody was killed. My first thought was of the inmates’ intercession. This morning in a BBC article on the bridge collapse “Dan Sligh, one of those rescued from the water, said the bridge had disappeared in a “big puff of dust”. “When the dust hit I saw the bridge start to fall,” he said. “At that point forward momentum just carried us over and as you saw the water approaching it was just one of those [times when] you hold on as tight as you can and I saw just a white flash and cold water. Men and women in our jails and prisons often know through the pain of confinement and deprivations and the trauma of many near-death experiences that life is fragile and precious. They often come to see that living life their way, as if their bodies are theirs to own and control, has not worked for them. They are readier than most to surrender their lives to Jesus, to agree with God to let their bodies be temples of the Holy Spirit. They often become intercessors for their families, our communities and world. I woke up this morning feeling grateful and inspired.